IT IS A PICTURE OF JOY AND JUBILATION. 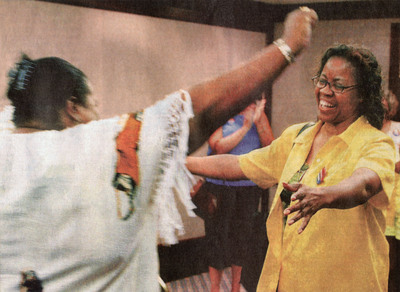 Rosa-Linda Demore-Brown, an enormous smile lighting up her face, holds out her arms to embrace Roberta Kitchen, who is rushing toward her in a blur of elation and relief. Republicans and conservatives were latecomers to the civil rights movement in the 1950s and 1960s, and they have paid the political price for their tardiness. To this day, the great majority of black voters are Democrats and black electoral clout is invariably leveraged to advance liberal political goals. But the civil-rights battleground has changed from the era when Jim Crow and racist sheriffs were the enemy. Today there is no struggle in which more is at stake for black America than the struggle for school choice. And this time it is not Republicans and conservatives who are on the wrong side of the fight.